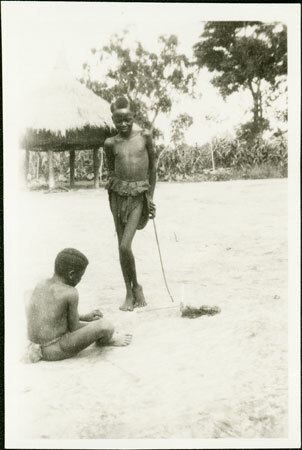 A boy sitting on the ground weaving a net to catch rats, with another boy standing beside him looking on. He holds the string taught using a stick in the ground and weaves the net close to his body. Next to the stick is another net. Morton, Chris. "Zande boy making net trap" Southern Sudan Project (in development). 03 Jan. 2006. Pitt Rivers Museum. <http://southernsudan.prm.ox.ac.uk/details/1998.341.358.2/>.